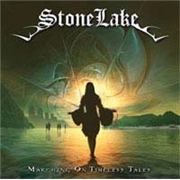 Swedish hard rock/melodic metal band STONELAKE releases their fifth album. The story actually begins back in 1984 when guitarist Jan Åkesson and vocalist Peter Grundström met after a concert. They both joined forces in Peter´s band the same year. A good few years later after moving on in various bands they were back together in STONELAKE. High quality hard rock/metal is promised, are we that lucky? Ten songs, titles that may well have been conceived in the 80´s and hopefully with the force and fantasy to make the band. Opener “Red Canyon” may not be my choice on the album but it still possesses a cozy keyboard pattern and a fine refrain. The ensuing “Liar” and “Sound of a Whisper” really don´t do anything for me. I need more direction and, unfortunately, better vocals. A bit more focus on refrain will come but why leave two early songs to chance? The OZZY-evoking “SnakeChild” moves in the right direction, as does my other favorites “Fool with No Denial”, and “Lay Down the War”. But none of them reach the real potential in melodic hard rock/metal. Sometimes they feel like running on empty, and without “it”, the hard to define edge that any metal album needs. They seem to have “it” in them, but perhaps that will be unleashed on the public the next time.